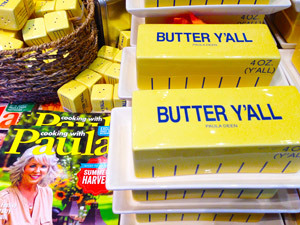 If you're a fan of Paula Deen and her cooking philosophy, this store is a must see. 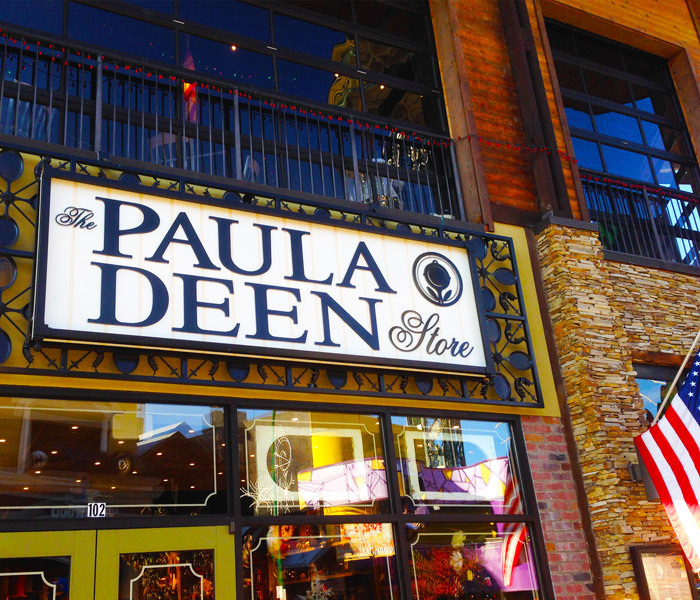 Located in the heart of Downtown Gatlinburg, the Paula Deen Store is a cookware store with a unique southern flair. Even if you're not a fan of the preeminent Southern celebrity chef, this shop is worth a stop for anyone interested in stylish, quality cookware or down home cuisine. The Paula Deen Store was opened on June the 20th, but Paula herself came to see the new store and make new ties in the community of Gatlinburg on June 9, 2014. Many fans gathered to witness the chef's visit to Gatlinburg. Inside, she was surprised and moved to find an original stove that was featured in her first cooking show. Visitors today can still see the stove that Paula used to build her career as a celebrity chef. In addition to cookware, the store offers a variety of Paula Deen cookbooks, aprons, oven mitts, and Paula Deen memorabilia. Many of these items proudly feature famous Paula sayings from her storied career as a chef and a symbol of southern fare. Visitors to Gatlinburg can now own their very own "It's Butter Ya'll" butter dish. Ornate dinnerware, serving plates, silverware, and more that feature classically southern details and decoration are also available at the store. Not quite up to Paula's chef status? No worries! Premade dishes, cake mixes, jams, spices, and spreads can also be purchased here, including Paula's Ooey Gooey Butter Cake. These food items make it easy to take a bit of Paula's cooking home without having to put in long hours in the kitchen. From pots and pans to serving dishes, this shop has everything you need to make delicious meals just like Paula! The Paula Deen Shop is located near the Gatlinburg Convention Center across from the Hollywood Star Cars Museum. The store is easy to reach on foot from several nearby parking lots and makes a great stop on a day spent shopping in Gatlinburg. The Paula Deen store is open from 10 am to 8 pm on weekdays and 10 am to 9 pm on Friday and Saturday. After enjoying this quintessential southern cookware store, you can experience other unique Gatlinburg destinations nearby like the Ole Smoky Moonshine Holler or see a view from the Gatlinburg Space Needle. The Smokies are practically buzzing with excitement over Paula Deen's interest in the region. In fact, Paula is set to leave an even bigger mark with her much anticipated restaurant in Pigeon Forge that will open in April 2015. Paula Deen's Family Kitchen in the Island is a 20 million dollar restaurant that will seat up to 350 guests. Inside, there will be a coffee shop, a sweets shop, and another retail space with even more items! At this restaurant, you can try Paula's recipes for yourself, while at the Paula Deen Store you can get everything you need to make delicious food yourself! Come see Paula Deen's great additions to the Smoky Mountains when you visit during a Gatlinburg, TN cabin vacation!